Don’t snicker. They weren’t always mainstays of your local light jazz radio station. Okay, perhaps they were, but they were also much more. In a period when hair was getting bigger, jeans more stone-washed, and bands younger and younger, a couple of cool customers from Britain created a bubble of astonishing calmness and maturity. After breaking fans’ hearts around the world by dissolving the Police, Sting knew he had better have a really good reason for doing so. Continuing to play the same reggae/ska-inflected rock that was the band’s stock-in-trade would have folks scratching their heads and whining, “Bring back Stewart Copeland!” So Sting took a page from Paul Simon’s book and started assembled some people of color. Unlike Simon, he manages not to sound like he’s anointing himself world music messiah. This is pretty amazing, considering that a number of the tracks on his first solo album, THE DREAM OF THE BLUE TURTLES, have incredibly serious subject matter, like nuclear war (“Russians,” anyone?). BLUE TURTLES also includes what might be the most beautiful, complicated song Sting has ever written, “We Work the Black Seam,” which musicalizes the UK miners’ strike of 1984 (you know, the one in BILLY ELLIOT). Mixing together strains of Celtic folk and jazz, it is a song that could make you forget that Sting would go on to record “If I Ever Lose My Faith in You.” Even more insane, the album went triple platinum and had four singles in the Top 40. If you haven’t listened to BLUE TURTLES in a while, dig it out and give it a spin: is it even conceivable that “Fortress Around Your Heart” would be a hit single today? 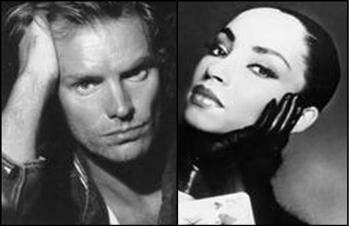 Sade is like the inverse of Sting – black singer, white band, female, starting in jazz and progressing to pop. I used to listen to her PROMISE album back-to-back with BLUE TURTLES on those weekends when my parents dragged me out to their campsite by a man-made lake in Jersey, which I spent primarily talking on the phone long distance with my friends. We achieved 90 minutes’ peace and togetherness with the one-two punch of Sting’s smooth tenor (which is practically an alto) and Sade’s cool alto (which is sometimes a tenor). Most folks remember her first (and biggest) US hit, “Smooth Operator” (“No need to ahhhsk…”), but there’s a community of like-minded people out there – most of them members of university Afro-Am organizations – who hold a special place in their hearts for “Is It a Crime,” a lament for lost love at once artful, classy, messy, and immature. Time marches on. The Cold War ends. The music industry gets greedier. Bands get angrier. Sting goes through male menopause. Sade gets a nasty divorce. The kids who are seeking something less MTV-oriented and slightly more musically challenging with a helping of diversity on the side start listening to Dave Matthews. But no matter how many fiftysomething couples may be getting it on while listening to “Fields of Gold” or “No Ordinary Love,” I’ve got S&S’s backs.